This Elite Double Crush lab custom nightguard is hard on the outside and has a soft interior to cushion the strong biting pressures from the teeth clenching and grinding during the night. This nightguard is retentive and comfortable and lasts longer than softer mouthguards and may be well suited for all persons with light to moderate clenching and some severe grinding. These nightguards are made from your own dental impressions assuring you of the optimal results. Made in the USA under supervision of a USA licensed dentist. Your lab custom nightguard kit comes with dental impression materials, instructions, and prepaid laboratory mailer. Modest postage fee includes three way shipping: To you,To lab and Back to you. You will receive directions, dental impression materials and impression trays which will allow you to make an impression of both the upper and lower teeth. The night guard will be made for the upper teeth unless otherwise requested. If you have questions please contact the mouthguard store for help. You will make 2 impressions one each of the upper and lower set of teeth. When you receive your kit, review the steps and instructions first. Soften the impression tray in hot water according to the provided instructions and mold around your teeth and gums. Allow the tray to fully cool before making the final impression. Take out 1 set of the two colored putty impression materials. When ready quickly mix the two putties together until the color is uniform, usually 30-40 seconds. Then roll the material into a sausage shape and place into each side of the impression tray covering all sides of the tray where your teeth will fit. Center the tray. Bite down and mold the excess material around you gums. Hold in place till the material sets, usually about 4 minutes. Use the same kit container and ship your impression back to the lab in the pre-paid mailer. The device helps treat jaw pain and discomfort by reducing the contraction force of the jaw muscles. See the following article for more information: http://mouthguardstore.com/articles/which-is-better-a-hard-or-soft-nightguard . Simply place the nightguard in during sleep. Some initial adjustment is common during the first few weeks as the body gets used to the device. Some people note excess saliva but this too will subside. Store the device dry in the provided case and clean only with a very soft toothbrush and mild liquid soap. Occasionally a disinfectant oxidizing tablet such as Efferdent or Oxygone can be used. If ongoing pain or other discomfort persists consult with your dentist for help. We believe that you will be completely satisfied with the Elite Double Crush lab custom dual laminate nightguard. If you have questions or concerns with your mouthguard, please contact the Mouthguard Store for help at info@mouthguardstore.com. Once the package is opened no refunds are available. The Mouthguard Store and the dental laboratory will assist you to get the best possible result from a do-it-yourself kit until you are satisfied. As the end user it is your responsibility to read and follow all directions and safety instructions carefully before self-fitting or making your own dental impressions. If you have dentures, loose teeth, dental infections you should consult your dentist prior to using any nightguard device or performing any self dental treatments. What is the indication for a nightguard? Nightguards are especially helpful to relieve the pain caused from nighttime clenching and grinding. •	These mouthguards can keep teeth from moving, protect expensive dental work, and protect teeth from wear and damage caused by your teeth grinding, clenching or jaw joint (TMJ) problems. Which type of Night Guard should I order? •	Generally a soft guard is for light clenchers, while the dual laminate is for moderate to severe clenching and the hard process guard is best suited for severe clenching. Will I be able to make my own dental impression? •	Taking your own impression is not difficult providing you follow our step-by-step instructions. •	Remember to push the teeth through the material until the teeth lightly touch the tray without tearing through it. •	Note: It is important to remember that a good impression should show both your teeth and gums. How long does it take to get my Night Guards back? 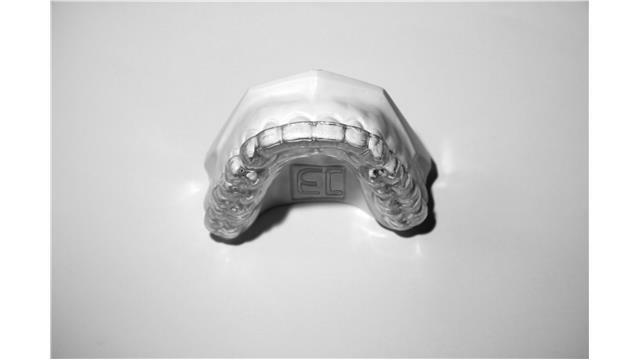 •	You will receive your Night Guard usually within 7 business days although the complete processing time may vary slightly. •	Most people adjust to the new appliance within a few days. •	Store a soft nightguard dry and clean with soap and water. •	The hard acrylic or dual laminate guard can be cleaned on the hard surface with a tooth brush and occasionally cleaned with a denture cleanser. •	Keep all mouthguards away from heat or pets and store in the protective case.